Saskia Lamche opened Diverse at No. 148 Fortess Road, NW5 in 2016. The story begins in the mid-1980s in Islington, when the landmark boutique at No. 294 Upper St was established by Saskia’s mother Gabrielle Parker. 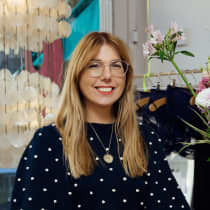 After completing an MA in Textiles for Fashion at St. Martins, Saskia learned the trade firstly as a buyer, working alongside Gabrielle for many years before taking over the running of Diverse in the early '00s. Diverse remains one of London's most vibrant and influential boutiques, with a product mix that appeals to a varied range of fashion lovers. "We are fashion lovers ourselves, so everything about the boutique and the labels we work with is deeply rooted in our own discoveries and preferences." ...Diverse by nature. After opening her own boutique in 2016, Saskia put her unique spin on its creative direction. Stocking a handpicked selection of under-the-radar brands, Diverse is a treasure trove of eye-catching fashion and accessories.